In general, the Easter Bunny hides store bought eggs all around our house for Easter morning. However, I like to make a little homemade treat for our extended family to celebrate Easter. This year I took inspiration from our homemade Valentine chocolate hearts. 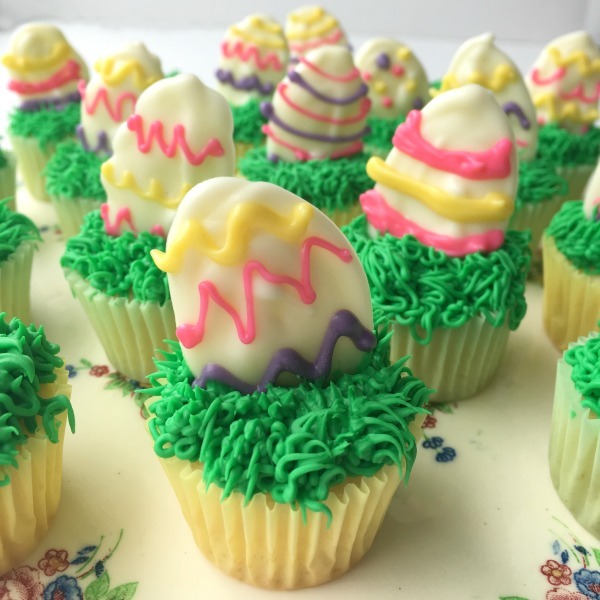 We made our own white chocolate Easter egg mini cupcakes. Seriously, how cute are these?! I’m in love with how super simple they were to make and how adorable they look. On top of a tuft of icing grass and a vanilla mini cupcake – these make an impressive treat to share. 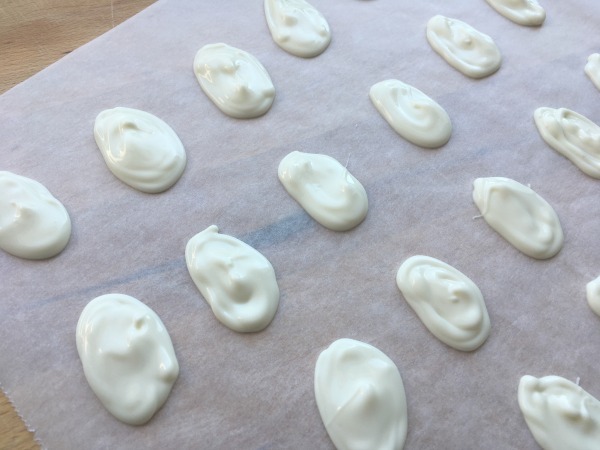 Begin by laying out a sheet of parchment paper. 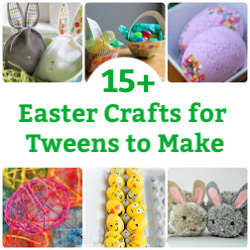 This is where you will make your Easter eggs. If you want the eggs to be exactly the same size, feel free to draw the outline of the eggs on the parchment paper. I chose to freehand the eggs. 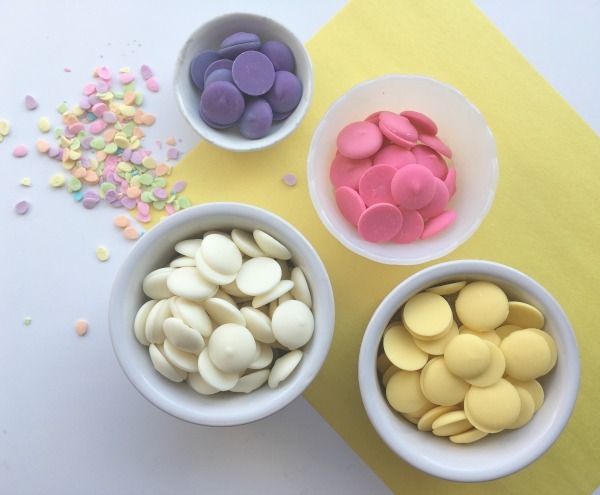 The first step to making these cute little Easter eggs is melting down the white chocolate wafers. There are two ways to melt chocolate. The first way to use a microwave. Place the chocolate wafers in a microwave safe bowl and heat them in the microwave 15 seconds at a time – until the chocolate is totally melted. We don’t have a microwave, so we use the old school method – using a double boiler. Heat a pot on the stove, with an inch or two of water in it, over medium heat. 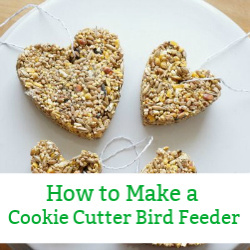 Place a metal bowl, with the chocolate wafers inside, over the pot of water. Stir the wafters until they are melted. Scoop the melted chocolate into a plastic resealable bag. Let the chocolate cool for 2 minutes. If you let it cool too long the chocolate will harden. If you don’t give it a minute to cool the chocolate will be too runny. After the chocolate has cooled, cut a very small hole in the corner of the bag. Now it’s time to create the eggs. Try and build the chocolate up to give your egg some dimension. 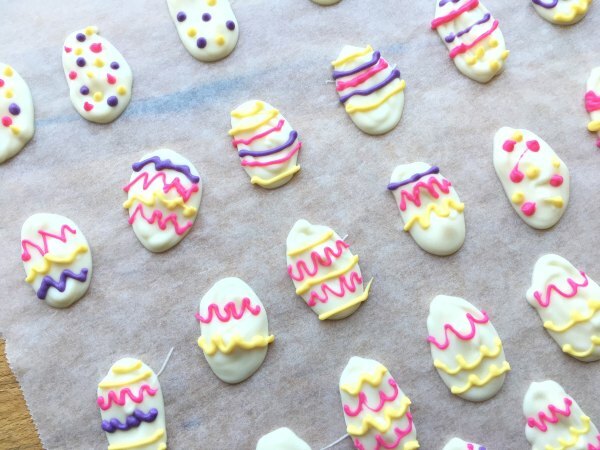 If your eggs have lines, rub the tip of the bag around in the chocolate to smooth it out. Let the eggs cool completely. Next, melt the next colour of chocolate. 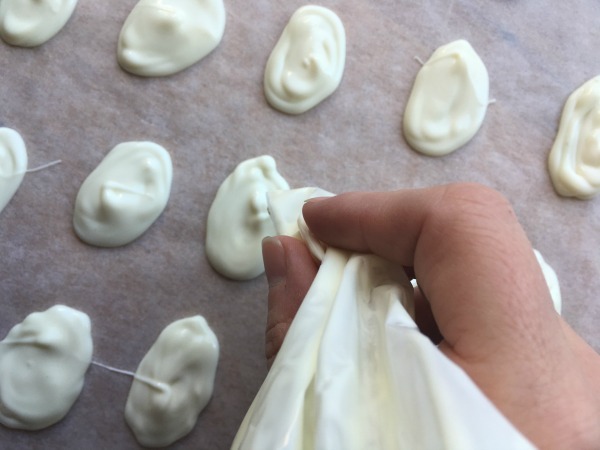 Follow the same steps as the white chocolate. When the chocolate has cooled, draw your pattern on the eggs. Have fun, alternating colours and patterns. Dots, swirls, zig-zags, lines, waves, you could even add glittery coloured sugars if you like. When the designs are done, let the chocolate eggs cool. 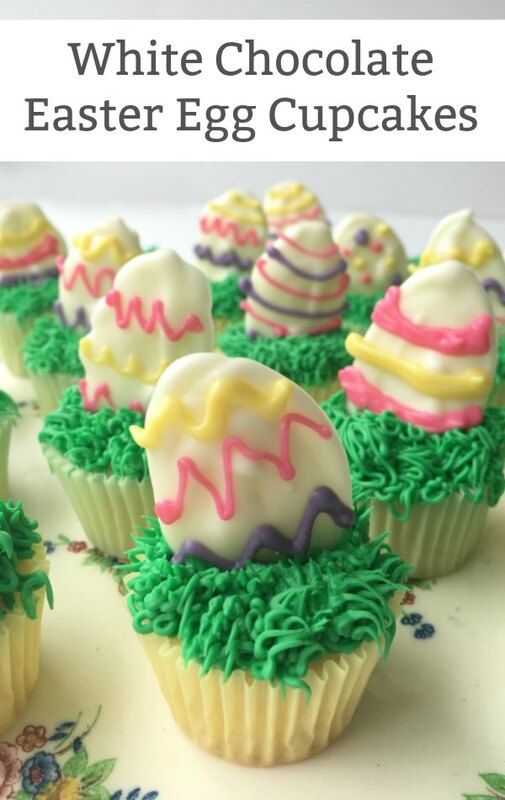 We chose to pop our eggs on top of super cute mini-cupcakes. 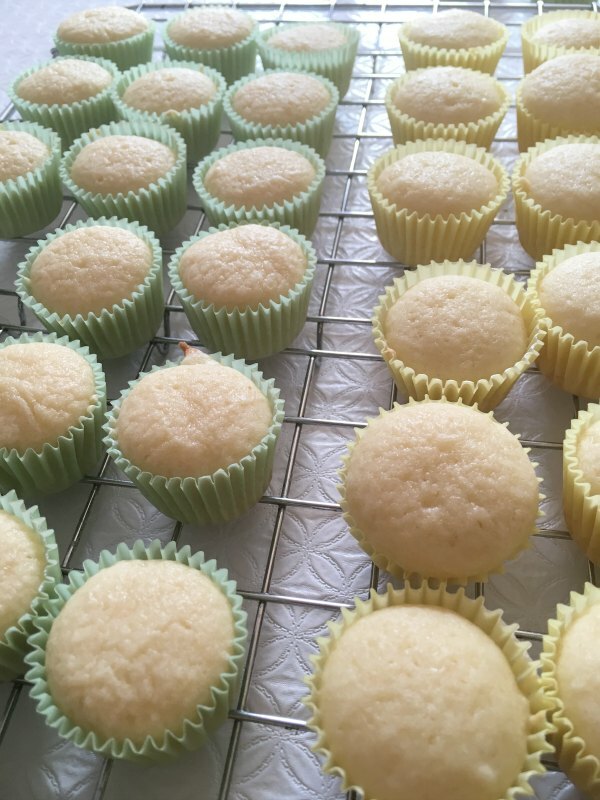 I used a basic vanilla mini-cupcake recipe from Genius Kitchen. I coloured vanilla icing (from a jar) with green food colouring and used a Wilton Multi-Opening Decorating Tip 233 to create the feathery grass. Poke the Easter egg into the grassy cupcake and you have an adorable showstopper dessert that you made totally from scratch. How cute are these?! We had a few eggs left over, so we will be wrapping those up in little cellophane bags to give to my daughter’s classmates. These are so crazy simple to make. 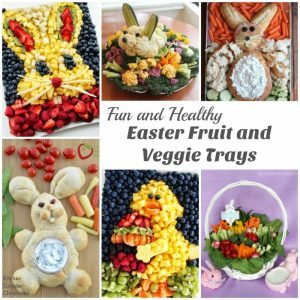 I think next time we will try making chocolate Easter bunnies! 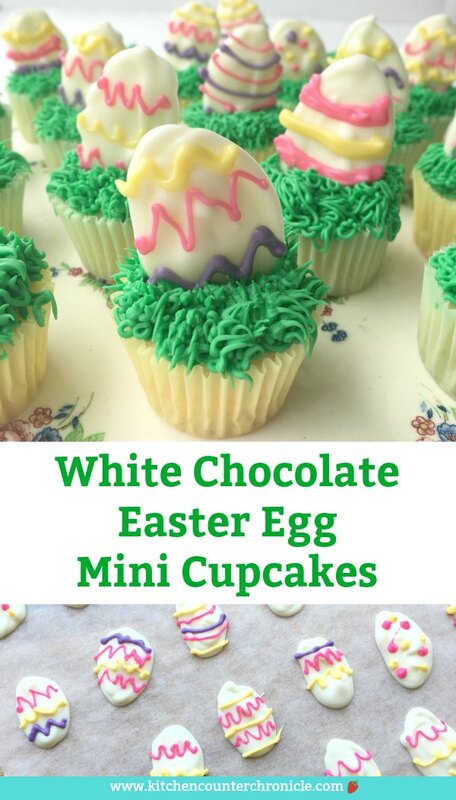 How to make super cute white chocolate Easter egg mini cupcakes. 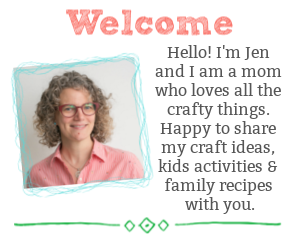 Seriously simple to make and so stinking cute. Nutrition Info is to be used as a rough guide only. Nutrition Info is based on the products I am using the same products/brands. Thus, the Nutrition Info may vary.